Alexandra Llewellyn’s handcrafted luxury game sets are timeless objets d’art designed to bring people together and reignite the passion for life’s simple pleasures. To purchase one of Alexandra Llewellyn's luxury game sets is to invest in the luxury of time spent with loved ones. In our screen-obsessed age, there is something to be said for the simple luxury of sitting down to play a game of backgammon. It’s an opportunity to unplug, slow down and engage with loved ones - to truly live in the moment and be present. The manufacturing process is extensive: every Alexandra Llewellyn set passes through specific stages in at least nine UK-based workshops, each specialising in different materials and methods. The ancient technique of marquetry is used in the creation of many of the label’s pieces: Alexandra chooses each piece of wood for the colour and grain that best describes the individual design elements and then cuts it by hand or with a laser cutter before putting it together like a giant jigsaw puzzle, pressing and hand lacquering it until glass smooth. 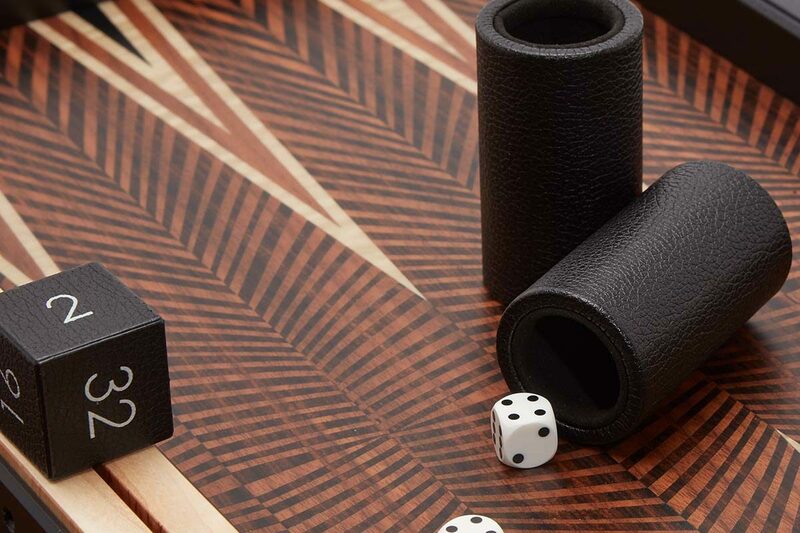 The playing pieces are weighted wrapped leather or weighted aluminium with leather bases and the playing compartments and dice shakers are lined in leather with a lip on the inside to ensure effective rolling of the precision dice. All elements are finally brought together in the studio, with each set uniquely tailored to the client’s specifications. Ultimately, each piece makes for an exquisite centrepiece in the home bound to spark conversation and bring family and friends together. With time at an increasing premium in the modern age, what more could one ask for?